I don't read a lot of memoirs. I don't have anything against them. I just typically choose fiction over non-fiction. 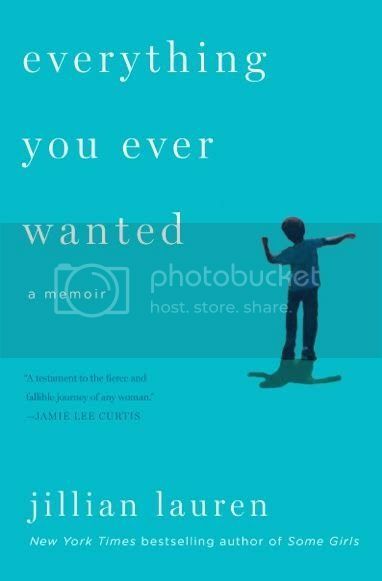 I was recently given the opportunity to review Jillian Lauren's latest memoir, Everything You Ever Wanted. This book chronicles Jillian's marriage to Weezer guitarist Scott Shriner and their struggles with infertility and adoption. She shares their son's journey from Ethiopia to America, as well as the behavioral challenges he faces along the way. Jillian doesn't take no for an answer and pushes herself and others to find help for her son. I loved this book because of Jillian's honesty. She doesn't sugar coat anything. She never claims to be a perfect person. She never claims to be super mom. Her daily struggles are real and require a lot of patience and strength. It's a story that any mother can relate to, the story about the unconditional love a parent has for their child. You can purchase Jillian's memoir on Amazon and read more about her family here. I can't wait to dive into her other books, Some Girls: My Life in a Harem and Pretty. Sounds really great. I like memoirs that have a point and are well written. I love memoirs! I don't know why. I just like seeing how other people live and what they've gone through. This one sounds really good. I want to check out her other books too.